Twelve doctoral students at the United States Sports Academy completed their comprehensive final examinations on the Academy’s campus on 7-9 July. Academy Department Chairs and doctoral students gather in the Academy’s Main Lobby. 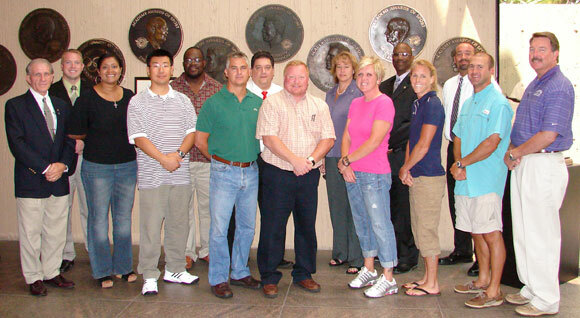 Pictured from left to right: Dean of Academic Affairs Dr. Arthur Ogden; Department Head-Sports Fitness and Health Dr. Jordan Moon; La Quita Denese Frederick from Chicago, IL; Sichan Park from Columbia, MO; John Starr from Lyerly, GA; Costas Solomou from Limassol, Cyprus; Chair of Sports Medicine Dr. Enrico Esposito; Mark Streiff from Evans Mills, NY; Chair of Sports Studies Dr. Pamela Wojnar; Christine Heather Welch from Nixa, MO; Chair of Sports Management and Director of Doctoral Studies Dr. Fred Cromartie; Suzanne Cooke from Aurora, IL; Chair of Sports Coaching Dr. Scott Johnson; Troy O’Neal Gamble from Anderson, SC; and Robert Stinchcomb from Rome, GA.
Doctoral students not pictured: Kai Yang Hu from Taipei, Taiwan; Boryong Kim from Busan, South Korea; and Cheng Ping Li from Taoyuan County, Taiwan.